Kibot Agent is a historical data downloader and a data collection software used to communicate to and download data from Kibot market data services. Kibot Agent will download market price history data for any ticker symbol that is supported by your subscription or is included with a purchased data package. You can download and install the latest version of the program by clicking on the Download button below or by following this link. If you are upgrading the program from a previous version you can download significantly smaller installation package from this link. We do not distribute any viruses, spyware, trojans, malware, adware, browser toolbars or anything similar with our software. Our software is 100% clean which can be tested by more than 40 anti-malware engines using web sites like metascan-online and virustotal. Downloaded data is saved locally and can then be easily imported into the trading software of your choice for your backtesting, charting, quantitative analysis and trading system development. Supported instrument types include US stocks, ETFs, Futures and Forex. Tasks can be automated and scheduled using built-in Windows Task Scheduler. The program provides all the tools for task management. The program supports tick, second, aggregate bid/ask, daily, weekly, monthly as well as 1 minute or greater interval historical data. You can download and save historical data for any ticker symbol available to your Kibot account. Data is saved in ASCII text format for compatibility with most trading and technical analysis programs. The program automatically converts data to Tradestation, NinjaTrader 7 and NinjaTrader 8 data format. Date and time values can be converted to a custom time zone or UTC time stamps. You can create portfolios and custom list of symbols to simplify file management. You can set date range for any task. Start and end dates are fully customizable. 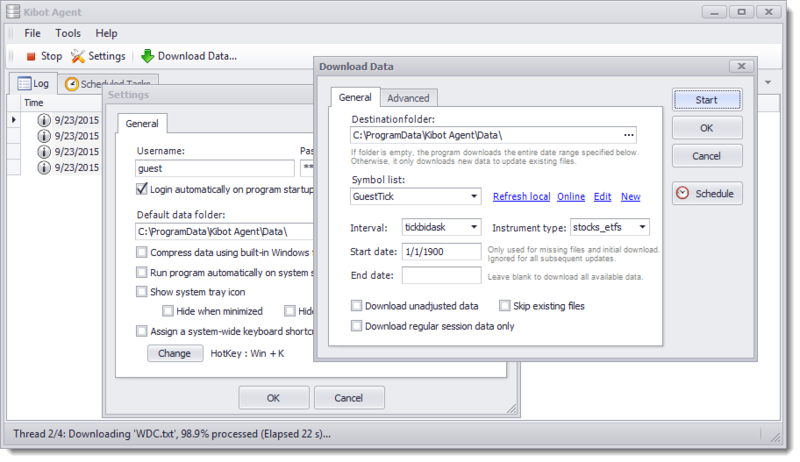 The program intelligently updates existing files by download missing data only. HTTP compression for data transfers provides faster download speeds. Support for built-in Windows NTFS file compression which reduces the required space to 1/10 of the original size. The setup program is distributed as a self-extracting exe file which, when started, will copy all the necessary files required for the program to run in a few easy steps. Click on the "Download Now" button to Open or Save the Kibot Agent setup program. If you choose Open the setup program will start automatically. If you choose Save then you will have to go to the folder where you saved the setup file and open it to install the program. Follow the instructions that appear on your screen to install Kibot Agent. After the setup program is finished you can start Kibot Agent by double-clicking on the Kibot Agent icon on your Windows desktop. Minimum 1GB RAM, about 150 megabytes of hard drive space, working connection to the Internet.